This much is true. 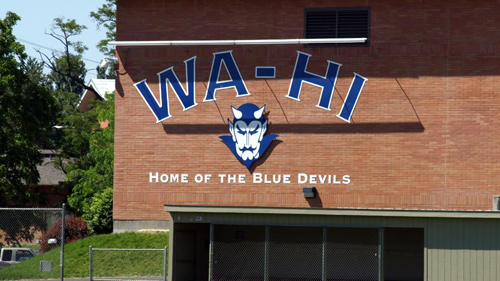 Any win over Walla Walla is a good thing. The Richland Bombers came out fast. After receiving the opening kickoff the offense ripped off a 12-play, 71 yard drive. Zach Whitby connected with Anthony Galat and the Bombers led 7-0. The Blue Devils first posession ended with a high snap on a punt attempt and Richland got the ball back on the Wa-Hi 37 yard lne. Four plays later, Bennett Peterson scored a touchdown on a four-yard run and with 5 minutes left in the quarter the Bombers were poised for a blowout. But Walla Walla wasn't reading the same script. After punting on their next posession, Braeden Boast intercepted Whitby's pass and returned it 37 yards to the Bomber 1 yard line. One play later Noah Porter ran for the touchdown. The extra point was missed but the Blue Devils were right back in the game at 14-6. The rest of the game evoked memories of a habidashery with yellow handkerchiefs decorating much of the landscape. Walla Walla was flagged for 9 penalties for 97 yards and the Bombers were cited 11 times for 118 yards. Much like last week, Richland spread the ball around among the four running backs. Bennett Peterson ran for 52 yards, Josh Phillips for 53, Nathan Perry for 55, and Anthony Galat got medalist honors with 57 yards on 13 carries. In the air, Zach Whitby through for 151 yards with all but 2 yards came in the first half. Whitby also spread the ball around, connecting with eight different receivers. The Bombers held their slim 8 point lead for almost three quarters despite several Blue Devil players battling cramps in the muggy, warm air. In the fourth quarter, Richland caught a break. Walla Walla had to punt out of their own endzone. Unfortunately for them, the punt only got to the 24 yard line. Richland kept the ball on the ground and Josh Phillips scored on a 5 yard run to give them the final cushion. Next week comes the real test, the Chiawana Riverhawks. While it is only the third game of the season next week's game is effectively for the Conference 4A championship and the ticket to the playoffs. Crazy, I know, but that is the new world order in the 4A. The Bombers had better come prepared. Chiawana has won their first two games by a combined score of 91 to 7. Obviously, they haven't played against a defense like Richland's but then again, the Bombers haven't played an offense like the Riverhawks. Next week is going to answer a lot of questions. So, remember to update your Google Calendar for Friday, September 20 at 7:00PM at Edgar Brown Memorial Stadium in Pasco for Richland versus Chiawana. Of course, you can start your pregame warmups by grabbing a sausage for twelve at the annual Christ the King Sausage Fest being held on the 21st and 22nd. What a great weekend! Tri-City Herald article from September 14, 2013 written by Jack Millikin.